What makes Austin Austin? 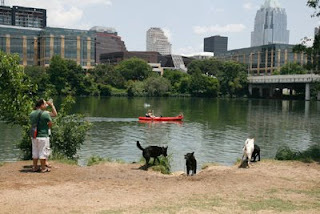 The short list would have to include Auditorium Shores and its view of the (ever-changing) Austin skyline. Ch-ch-changes: The city's Parks and Recreation Department's redesign of Auditorium Shores may eliminate the leash-free dog park because of complaints about dog poop that owners did not dispose of properly. The department will hold an Auditorium Shores Stakeholders Meeting at the Town Lake Center, 721 Barton Springs Road, tonight from 6 - 8 p.m. The public will be provided an opportunity to review the conceptual design.